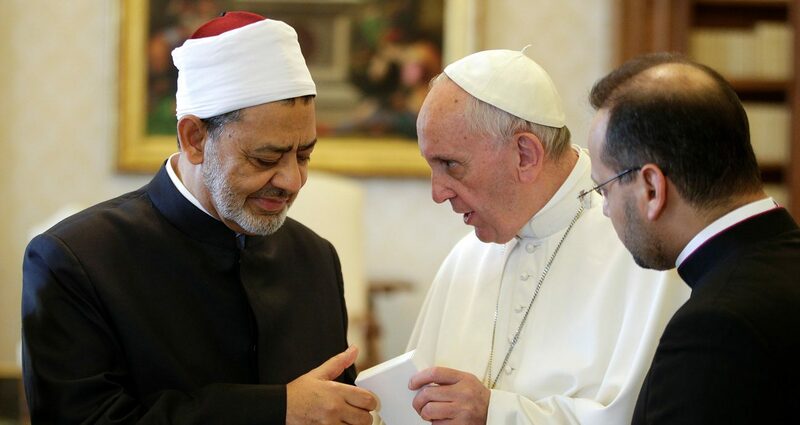 VATICAN CITY (CNS) — After five years of tension and top-level silence, Pope Francis and the grand imam of one of the most important Sunni Muslim universities in the world embraced at the Vatican May 23. “They then dwelled upon the common commitment of the authorities and the faithful of the great religions for world peace, the rejection of violence and terrorism (and) the situation of Christians in the context of conflicts and tensions in the Middle East as well as their protection,” Father Lombardi said in a statement. At the end of the audience, Pope Francis presented the grand imam with two gifts: a copy of his encyclical “Laudato Si’, on Care for Our Common Home” and peace medallion depicting an olive tree holding together two pieces of a fractured rock. After meeting the pope, the grand imam was scheduled to travel to Paris to open the second international conference on “East and West: Dialogue of Civilizations” May 24 sponsored by al-Azhar University and the Catholic Sant’Egidio Community.